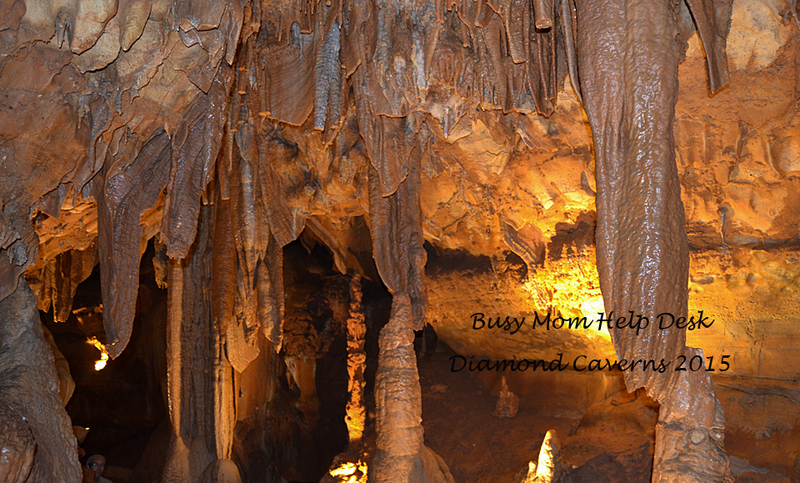 Diamond Caverns WEbsite: click here. Our original plan was to go on the Mammoth Caves tour- but our trip was sort of last minute and the tour we wanted to go on was sold out. 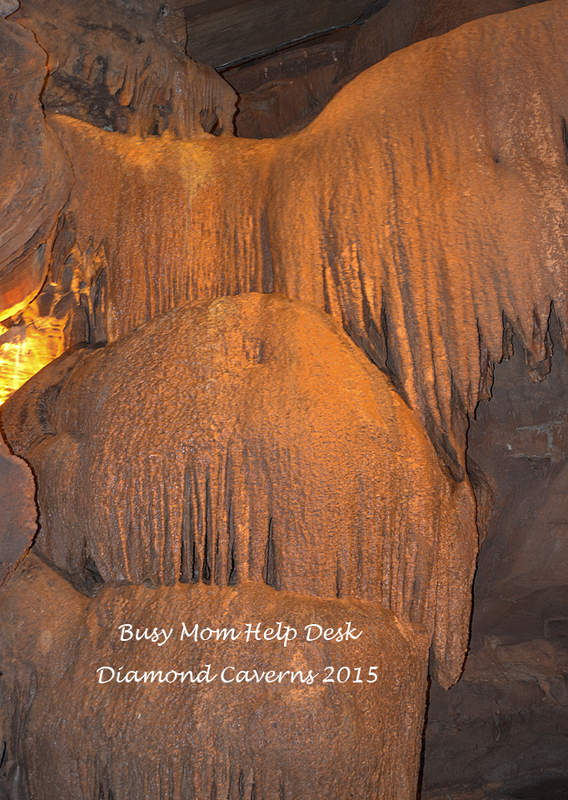 We found Diamond Caverns on-line, and it was only a few minutes from Mammoth Caves (maybe 5-10 minutes away). They do tours every 30 minutes (9am-5pm) with no pre-registration required. So this fit our schedule perfectly! It was 90 degrees outside the day we went, and only about 55-60 degrees in the cave. It was a great escape from the outside temps. There are about 350 stairs throughout the tour, so keep that in mind when deciding if it’s the right tour for your kids. My 6 and 10 year old did pretty well but I’m not sure it’s right for younger kids. The tour guide was extremely knowledgeable on cave formations and the history of this specific cave itself. 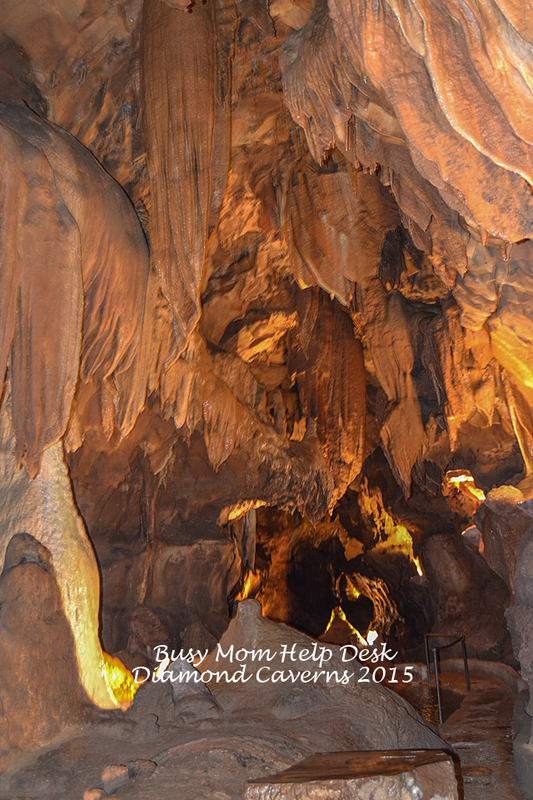 The cave is lighted with a cement pathway for ease of traveling through. They do allow flash photography but are careful to point out what you are allowed to touch and what you aren’t. There are some “finished” pieces of formations which were cut in the 1800’s during exploration. Since those are cut and feel “polished” you are allowed to touch those but great care is given not to touch any standing/ hanging formations. This is a wet cave, meaning it’s still forming. Once you touch a wet formation it will either stop growing, or greatly slow down. Their tours last about 1 hour and go 1/2 mile round trip. They list it as moderately strenuous which I do feel is fitting considering all the stairs. Adult Admission as of August 2015 is $17.00 and ages 4-12 are $8.